Santillana del Mar to Oviedo. Travel 2017. Day 7. Santillana to Oviedo. Sunday, October 1/17. Our next stop after Santillana del Mar was Oviedo, capital of the Principality of Asturias. For many years it was capital of the ancient kingdom of Asturias following the invasion of the Iberian Peninsula by the Moors in 711. 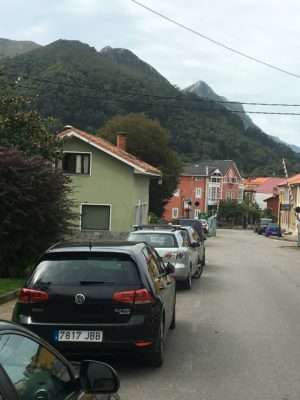 Oviedo is only about 170 kilometres/ 105 miles west of Santillana, less than 2 hours by car on the largely coastal road, the E70 (which confusingly becomes A8 in parts and is also known as the Autovía del Cantábrico). We entered Asturias crossing the estuary of the River Deva (famous locally for its trout) from Unquera (Cantabria) to Bustio (Asturias). The landscape was similar to that of Cantabria: wild beaches, sandy coves, picturesque fishing villages and colourful ports. To the left, as we drove westward, green pastures rose quickly to forested hills. Behind the hills, we could sometimes make out the Picos de Europa Mountains, part of the Cantabrian massif that runs like a jagged spine across the north of Spain. Pastel coloured houses at Nueva, Asturias. We noticed that as in Cantabria, the houses –especially the newer ones— along the coastal strip tend to be more colourfully painted than the stone buildings in the inland valleys. White and pastel variations of blues, greens, yellows, orange seem to be favoured in villages and on the houses and farms dotting the countryside. In ports and coastal villages, glassed-in balconies are common, to protect from rain and wind blowing in from the sea. Although there is much that is geographically, economically and socially similar between Cantabria and Asturias, Asturians are quick to point out that they have an illustrious history whereas Cantabria was for a long time seen more as an extension of Castile (in fact, Cantabria achieved separate status as a political entity only in 1981 when it became one of Spain’s autonomous regions following the terms set out in Spain’s constitution of 1978). It has been said that Asturians claim that “Asturias es España, el resto es tierra conquistada”, “Asturias is Spain, the rest is conquered land.” This pride is born of historical events: around 720 the conquering Moors suffered their first defeat in the peninsula deep in the mountains of Asturias. As a result, the region has since been revered by many Spaniards as the “cradle of the Reconquista,” the gradual recovery of the land dramatically lost to the Muslims between 711 and approximately 720. Linking past and present is the title held by the current heir to the Spanish throne: Prince (or since 2014 Princess) of Asturias. 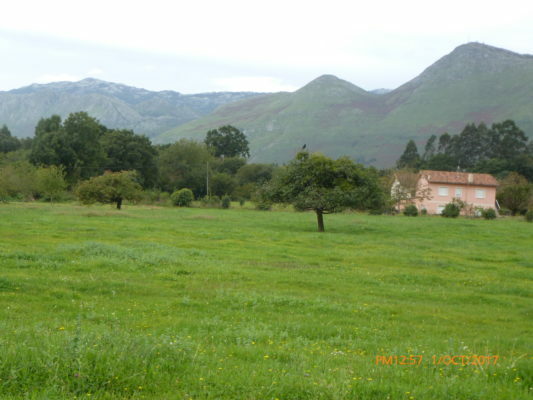 Countryside near the coastal town of Llanes. We took our time along the coastal road, stopping occasionally at spots that attracted our attention. 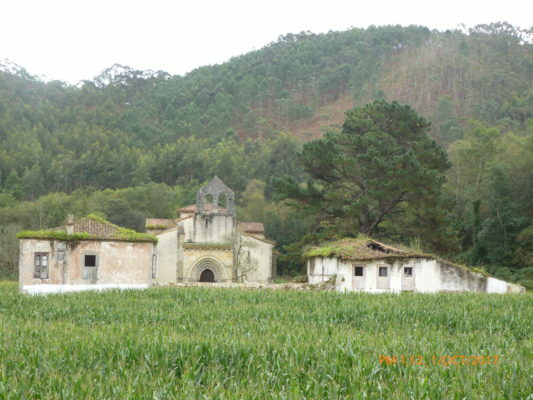 A few kilometres west of Llanes, we came across the isolated ruins of the Monastery of San Antolín de Bedón, a 13th-century Romanesque church, a short distance from the beautiful estuary of the River Bedón. 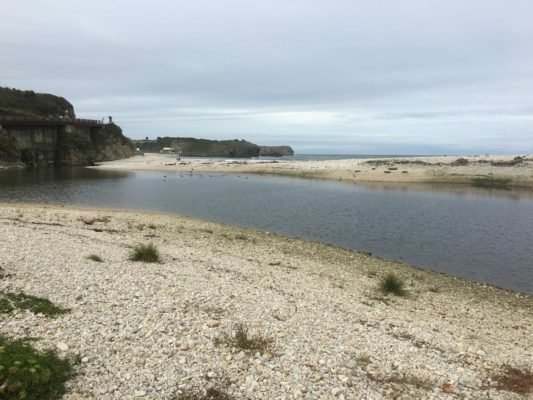 Estuary of the River Bedon. At Villaviciosa (where we had lunch), we turned inland towards Oviedo skipping the motorway for a lesser road, the AS 113. 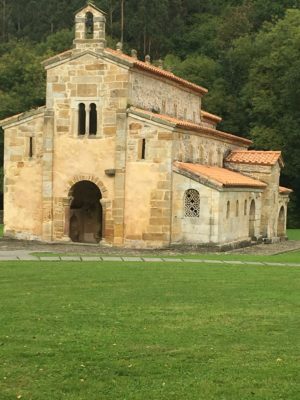 There was a reason: we wanted to see the Iglesia de San Salvador de Valdediós, a pre-Romanesque church built in a style that is often referred to as Asturian church architecture. There are several in the Oviedo region, built within a 50 to 70 kilometre/30 to 43 mile radius of the city, and almost all constructed from about 800 to 900, i. e. at the same time that Islam had entrenched itself in Moorish al-Andalus. San Salvador was consecrated in 893 by King Alfonso III of Asturias. It was well signed, and we left the AS113 and descended fairly steeply to the hamlet of Valdediós. San Salvador de Valededios with Cistercian abbey behind it. The church sits against a background of hills and trees; close by is a Cistercian monastery dating from 1200. For a long time the monastery was abandoned, but from 1992 it has been undergoing restoration and now houses a hostel to help cover expenses for the renovation and upkeep. 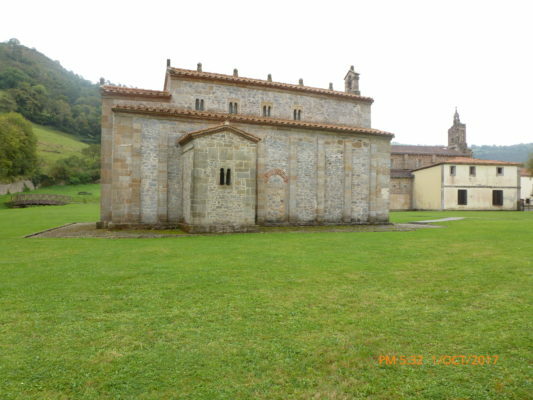 San Salvador, like most of these pre-Romanesque Asturian churches, is a small building following the basic basilica ground plan of a central nave flanked by two side aisles. The nave stands quite a bit higher than the aisles, emphasising height over width and length. The main entrance has a semi-horseshoe arch while above, interestingly, a pair of narrow horseshoe arches are set within a rectangular frame, known as alfiz. Although the horseshoe arch is frequently attributed to Muslim architecture, it was in fact already practiced by the Visigoths who dominated the peninsula from ca 411 to 711. However, the alfiz is more likely reflective of Moorish influence and probably migrated north with Christians fleeing Moorish al-Andalus in the 9th century. It was late afternoon when we were in Valdediós, and so unfortunately we were unable to go inside San Salvador. Still, its picturesque rural setting and peaceful surroundings (and no tourists … except us!) was some compensation. We were now only about 40 kilometres/ 25 miles from Oviedo. We had booked into Hotel Casa Camila, which we knew was on a hillside just outside the city. With our GPS/SatNav, we did not anticipate any difficulty in finding the hotel, but… Casa Camila was on the far side of the city and our GPS wasn’t up to the task. This was the first time we had used it in an urban setting and we were faced with two challenges: 1. The GPS’s pronunciation of the Spanish street names was so unrecognisable that it was useless, and 2. The street names were difficult to locate, often being small and placed way up the side of buildings, in other words more suited to the leisurely pace of donkey or mule traffic than to car speed. After suffering the frustrated honking of drivers as we stretched our neck to locate street names, we’d had enough. Solution? I approached a taxi and asked the driver to lead us to the hotel. When I gave him the name of the hotel, he sighed and shook his head. “Muy difícil (Very difficult)” he said and then added almost apologetically “muy lejos (very far).” He was right, it was very difficult, although not really too far. We followed the taxi up a steep, winding and progressively narrower road until it came to a sudden stop, and the driver waved us to a small parking area. We had finally arrived! It was 8 euros well spent, and as compensation, the view looking down on Oviedo was spectacular. But there were lots of steps down to Casa Camila and by the time we had navigated our suitcases down and into the hotel foyer we were tired and I was rather irritable. However, the hotel owners, Alejandro and Antonieta, were wonderful and more than willing to help us look for other accommodation if the steps were too difficult. We decided to stay and didn’t regret it. Alejandro spoke English very well, and printed us a map of the city, and both he and Antonieta were very helpful in giving us directions and helpful hints of what to do in Oviedo. Our immaculately clean room was on the ground floor, looking across the lawn and down towards Oviedo. We’d had our main meal, but Antonieta served us tea and biscuits/cookies and we were ready for an early night.